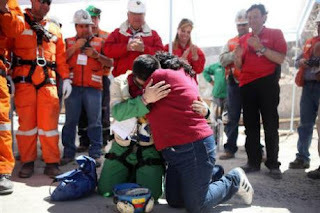 My writer friend, Greg Asimakoupoulos, has penned some poignant prose regarding the miraculous rescue of the Chilean miners. I thought this should be shared with my Pilgrim Scribblings readers. Thirty-three men and one common prayer. deep in the bowels of Mother Earth. "Up from the cave they arose!" Note: For more of Greg's work click here. Here's an article worth reading regarding the miners.